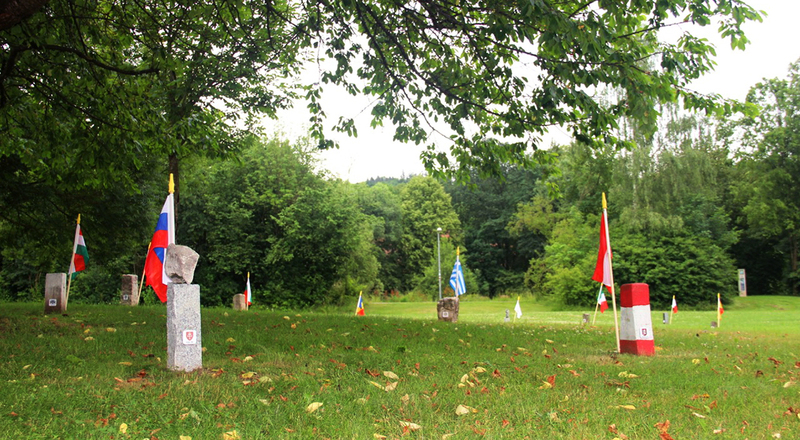 Alois Öllinger – artist in the region of Bad Kötzting – had the brilliant idea to place 15 different boundary stones in an united circle in the Spa gardens of Bad Kötzting. This was back in 1999 when Douzelage had 15 member towns. Today, Douzelage has 28 member towns, so it was time to reinvent this work of art and add the missing 13 stones! Thanks to the input of the ‘new’ towns and the ongoing enthusiasm of the Bad Kötzting team, the missing 13 stones plus the 15 already present stones were placed in a spiral, symbolically representing the dynamics of partnership, which overcomes boundaries without obliterating the characteristics of each partner town. This calls for a grand opening! And so it was! Present were delegates from Douzelage towns Marsaskala, Siret, Chojna, Köszeg, Rokiskis and Sigulda and guest town Velletri (Italy), the town council from Bad Kötzting and those who took interest in this joyful event. Markus Hofmann (mayor of Bad Kötzting) officially revealed the artwork and he and Annigje Kruytbosch, President of Douzelage Europe, spoke a few words. Great musical entertainment was added by The Brass band ‘Weißenregen’. Bad Kötzting recently hosted a GM, but still all of us have a great excuse to visit the park in Bad Kötzting and trot from one country to another by simply taking this spiral road!